​Stone was not the only medium in which Armenian artists worked. Particularly in Cilicia, some beautiful silver work was done on book bindings and reliquaries, particularly a triptych with embossed figures of Christ, angels, saints, and the donor who made a gift of it to a feudal lord in the fourteenth Century. Its style is delicate and simple, rather like the early stone cutting we have noted. Lord Kinross was aware of these features when he wrote: "The Armenians were, and indeed still are, skilled silversmiths, and the art of their stone-cutters recalls that of jewelry, from delicate filigree to bolder chain designs. Their pleated ropes, their interlaces of circles and lozenges, squares and triangles, zigzags and keys resemble modern jewelry: both intricate in conception and simple in effect." Painting was another form of decoration used in Armenian churches. From pre-Christian times, there is only one extant example of pictorial art, a mosaic from the temple of Garni which shows the Ocean and the Sea as personified deities. There are also a few badly damaged examples of mosaic work from Christian churches, but the more common medium is painting; the use of mosaics was apparently reserved for very special churches. The real history of Armenian religious painting is to be found through the study of the numerous illuminated manuscripts of the Gospels which her artists produced. These were extremely precious to the people, and the act of copying a manuscript was considered as praiseworthy as erecting a church. We have descriptions of the problems of monks, who, fleeing their monasteries in a time of foreign invasion, would carry with them the manuscript they were working on, sometimes not completing it until they had fled again and taken it with them to a third place. We have few examples of manuscripts predating the ninth century. Ones from this period show Byzantine and Persian influence, and their style is for the most part severe and stylized. No emotions are portrayed, and the clothing which the figures wear falls stiffly, not revealing the contours of their bodies. The walls of the church at Aghtamar, the only one which has retained its painted decoration almost entirely, have the same style. 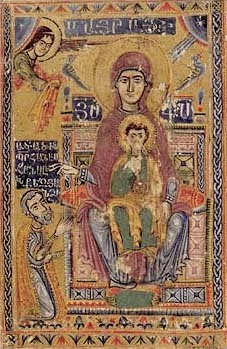 If the Armenians used Byzantine art as a model for the manuscripts, they nevertheless added features of their own. By the eleventh century, for example, canon tables were being framed by drawings of trees, something which does not appear in Byzantine art. The Gospel of Moghni, from this period, is more linear in style than its Byzantine models, the artist has put griffins and fantastic animals with human heads around the canon table, and the faces of the figures look distinctly Armenian. By the end of the twelfth century the manuscripts are very elegant and refined in style, and quite obviously are no longer dependent on Byzantine models. The Cilicians did beautiful manuscript work, rich in color and varied in motif; "The Armenian ornamental repertory is more varied than that of the Byzantine manuscript; at the same time, the compositions avoid the heavy profusion of Muslim decoration." Some of the decoration is very whimsical, with imaginary creatures and human or animal heads replacing the leaves in floral scrolls. Such originality is most evident in the work of Toros Roslin, who is the leading of the thirteenth century. The formal severity of the earlier style gives way, in his work, to spontaneity and liveliness. His figures are graceful and often emotional, while his interpretations of Gospel passages are frequently personal. In a depiction of the Last Judgment, for example, he shows the wise and foolish virgins seeking entry to heaven. The five wise virgins are ascending, and apparently will be allowed to enter, but the five foolish ones cower in a corner while an apostle emphatically closes the heavenly door to them. Painters other than Roslin during this period emphasize emotion, movement and realistic scenery in their work. By the fourteenth century, the style of manuscripts had reverted to the original simplicity and formality of earlier centuries. The work of Sarkis Pidzak foregoes ornate floral decoration in favor of simple geometric designs. His figures are not slender and flowing but short and rather heavy. Facing pages are often identical in manuscripts of this period, unlike those of the centuries immediately preceding, when there was such great variety that not two pages of a manuscript were decorated alike. The Mameluke conquest of Cilicia ended artistic activity there, but in Greater Armenia it continued into the seventeenth century, and the manuscripts produced there show the influence of the Cilicians, with rich colors and vivid ornamental composition. It is interesting that many of the well-known modern Armenian painters are known for the rich hues of their paintings, and it may be that many of them are familiar with the liturgical art of earlier centuries. 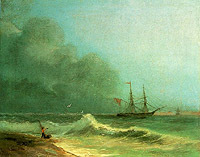 Under the patronage of wealthy Russians in the nineteenth century Hovhannes Aivazovsky, born in the landlocked country of Armenia, became famous for his seascapes with their romantic imagery. 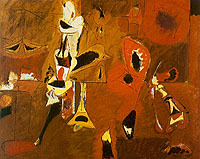 Arshile Gorky, in the early twentieth century, was one of the leading painters of the abstractionist school. 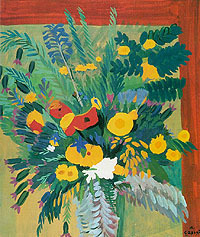 Today I the Soviet Union, Akop Akopyan paints Armenians in a way reminiscent of iconographic representation; Minas Avetissyan is known for the bold color of his impressionistic paintings; Martiros Saryan has been known for many years as a master of color and of the blending of Western with Oriental influences in painting. "By nature, the Armenians are deeply religious, as their whole literature and history shows. It has been a religion of the heart, not of the head. Its evidence is…to be found in…a brave and simple record written with the tears of saints and illuminated with the blood of martyrs." So wrote a visitor to Armenia almost a hundred year ago. His words are true, for the Christian faith of the people was the basis of all the art we have discussed here. And while the history of those people is a sad one indeed, perhaps its most important lesson is that despite the sadness, a people may still retain the joy and love of life that made their survival and their artistic achievements possible.